Before gaining independence, Mauritius was ruled for five centuries by the Dutch, French, and British, and it attracted waves of migrants from India, China, and Africa. 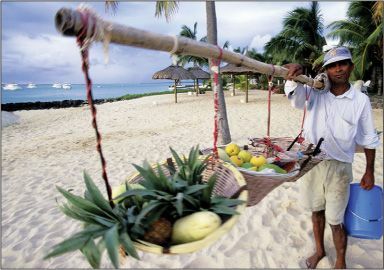 All added to the island’s linguistic mix— Santosh speaks English with a French accent, and talks to his family in Creole— and to its food. At a market in Quatre Bornes, a hill town surrounded by mountains that “look photoshopped into the background,” I tried my first gâteau piment: a deep-fried chickpea fritter that’s studded with chilies and often eaten with bread and cheese at breakfast. During a food crawl one night in the capital, Port Louis, I gorged on roast chicken, mine frite (stirfried noodles), and crepes slathered with Nutella and sprinkled with fresh coconut. “But really, what of those beaches?” There’s a good reason tourists head to Long Beach, Grand Baie, and Le Morne, but locals have their own choice seaside spots. At Flic en Flac beach on the west coast, I bought chunks of fresh pineapple coated with tamarind and chili salt and savored my snack in near solitude. At Blue Bay in the east, I chatted in Hindi with a group of women singing and dancing to Bhojpuri songs. “It’s a day off from husbands, kids, and responsibility,” one told me. Every Saturday evening on public beaches across the island, I learned, Mauritians host barbecues rich in biryani and booze. “If only more visitors got off their loungers and lobbied for an invite.” At Lux Le Morne (luxresorts.com/luxlemorne), doubles start at $230.